On Sunday in Melbourne, Australia, Roger Federer won his 16th Grand Slam title with a straight sets — 6-3, 6-4, 7-6 (13-11) — victory over Great Britain’s Andy Murray in the finals of the Australian Open. It came one year after a five-set loss to Rafael Nadal in the Australian finals left Federer drained and bawling on the court at Rod Laver Arena. On Sunday, Federer tried to explain what the match meant. It’s another title, his fourth at the Australian… and his first as a father. 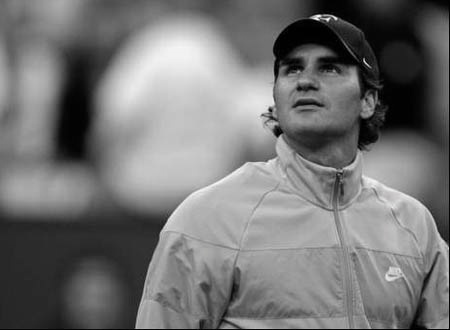 – On Aug. 8, 1981, Roger Federer was born near Basel, Switzerland. – On Aug. 1, 1981, seven days before the birth of Roger Federer, MTV launched as a cable channel in America. – Twenty years later, in the summer of 2001, Roger Federer defeated seven-time Wimbledon champion Pete Sampras in the fourth round at Wimbledon. Federer snapped Sampras’ 31-match winning streak at the All-England Club. – Federer won Wimbledon in 2003, his first Grand Slam title. – Since Federer’s 2003 Wimbledon title, there have been 27 Grand Slam tournaments. – Federer has won 16 of them. No man has ever won more. – U.S. major champions John McEnroe (7), Andre Agassi (8) and Andy Roddick (1) have won 16 Grand Slams — combined. – Federer’s contemporary rivals — Roddick, Lleyton Hewitt, Rafael Nadal, Andy Murray, Novak Djokovic and Juan Martin del Potro — have won 11 Grand Slams — combined. – Federer has appeared in 23 consecutive Grand Slam semifinals. – Federer has appeared in 18 of the last 19 Grand Slam finals — and 22 of the last 27. – When Federer wins the first set at a Slam, he is 172-5. – When Federer wins the first two sets a Slam, he is 156-0. – Federer won a gold medal in the 2008 Beijing Olympics — in doubles.